AshleyNewell.me: HHH: Thank Goodness It's Friday!! HHH: Thank Goodness It's Friday!! Well, Friday means only one more day of work before Dustin is off for the week. And by that I mean he works Saturday too. But hey, we're getting close and that's all that matters. This week has been a challenge. 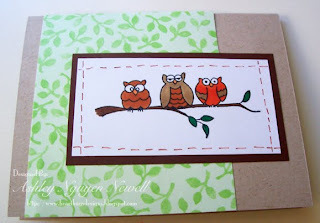 Speaking of challenges, I made this card for the Clean and Simple challenge on SCS this week. The challenge was to use stitching or faux stitching on your projects. I used faux stitching since I don't know how to sew. The stamp is Unity's 3 Whooligans. So fun, huh? Very cute Ashley! That dp goes great with your stamp! I agree with Ryann, that DP really suits the card! Supah cute girlie! Hope your day is better today! great CAS card, Ashley! love those little guys, great stitching details. This is one cute CAS card. Thanks for the inspiration. Very cute! Great colors and love the stitching. Super cute, Ashley! Hope all is well with the kiddos! This is darling, Ash. I love that stamp. ah.. love this! need to ink this one up.. and use it! Super cute! Love those owls! Ashley, luv the colorful owls...cute!